Announcement PLEASE ASK US ABOUT COUNTRY SPECIFIC SHIPPING- WE WOULD LOVE TO SHIP TO YOU! We appreciate your business but we try to keep it simple and WE DO NOT DO RESERVES, LAYAWAYS or ANY NEGOTIATING ON THE PRICE. PLEASE ASK US ABOUT COUNTRY SPECIFIC SHIPPING- WE WOULD LOVE TO SHIP TO YOU! Exactly as photographed but a bit smaller than I had hoped. But, it's my own fault because I knew the measurement in advance. They are a lovely earring and, if I don't keep them, I would be proud to give them as a gift. 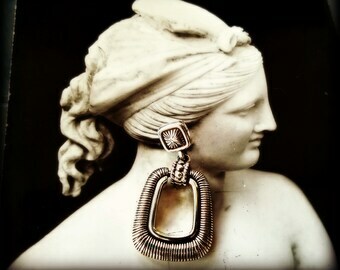 We try our hardest to bring you the greatest quality and the most interesting Vintage Jewelry. Check out our other vintage shop www.etsy.com/shop/iswasvintage. Sorry, but we do not do any layaways, reserves or negotiating on the price. We ship using USPS Flat Rate Shipping with Delivery Confirmation, unless otherwise noted. PLEASE ASK US ABOUT COUNTRY SPECIFIC SHIPPING- WE WOULD LOVE TO SHIP TO YOU!